This piece is part of the growing series of "Ten Ways" tools from Faith Formation Ministries. We invite church ministry leaders to use these one-page resources as a springboard for conversation, training, and planning around faith formation matters. Up to nine copies per church are available at no charge. 10 or more copies will be charged $.50US/$CDN each plus appropriate shipping/handling. Please call 800-333-8300 to order printed copies, or download this resource free on The Network. 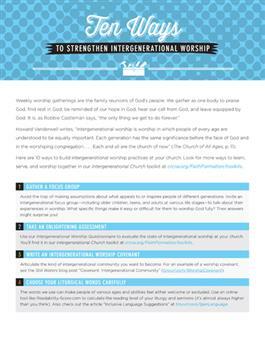 From evaluating your worship space to incorporating all five senses in worship, these ideas will help your church actively include people of all ages in worship.